Michigan fly fisherman are some of the luckiest in the country. We have high quality fly fishing for almost every freshwater species you can think of. Michigan has thousands of miles of trout streams. The birthplace of Trout Unlimited, the Holy Water of the AuSable River is justifiably famous. However we have several other rivers that are just as good. The Manistee and Pere Marquette Rivers are equally productive. Michigan has a rich tradition of dry fly fishing but it is also a hot bed for the latest in streamer trends. Another facet of trout fishing in Michigan is night fishing. With the famed Hexagenia Limbata, a huge mayfly that hatches at night, there is a night time fly fishing culture in Michigan. Add to that the amount of mousing we do at night certainly puts us near the top of the list in fishing blind! The other cold water fly fishing in Michigan is for anadromous species, steelhead and salmon. Steelhead are available in Michigan Rivers from July to May. They can be captured on swung flies or using a variety of nymphing techniques. Salmon can be fooled by big flashy streamers moved very fast to mimic fleeing baitfish. They will also eat dead drifted eggs and nymphs. We have a plethora of bass (smallmouth, largemouth and rock bass) water, both lakes and streams. We fish for them with both poppers and streamers. The same lakes typically hold panfish, gods gift to the beginning fly angler. Pike and Muskie are abundant in some waters and can provide thrilling eats to the angler willing to devote some time to it. Last but not least we do a lot of fly fishing for carp. The flats in the lakes and bays in Michigan provide the perfect environment for fly anglers to purse these picky bottom feeders. They are a great fish to hone your casting skills and work on your accuracy. To sum this up I refer you to this article by Kirk Deeter wherein he justifies his belief that Michigan is the number one fly fishing state in the union. 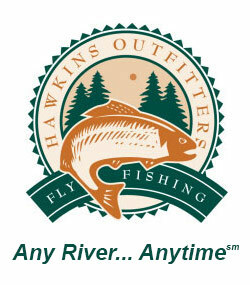 I agree with him and hope you let Hawkins Outfitters show you first hand the diversity and quality of our fishing.